Deraldo Ferreira, founder and director of the Brazilian Cultural Center of New England, is also the founder and leader of the Samba Tremeterra batería. For the past 20 years, he has run the Brazilian Cultural Center while teaching capoeira at the Center and at local schools and colleges. Additionally, continues to be committed to his lifelong love of music. Deraldo has been a drummer since early childhood, and has taught samba drumming since the mid 1990s. In 1998, he and his students collaborated to start a professional samba group which, from then on, entertained at regular samba parties at the Center as well as at other events throughout the region. At this time, Samba Tremeterra is larger and has extensive experience performing exhilarating shows, both alone and with local and international bands and vocalists. Currently, we do not sell the CD online. However, you can buy a copy of the CD when you visit the Brazilian Cultural Center in Cambridge or attend one of our performances elsewhere. You can also call us or send us an email to arrange a special purchase and delivery of the CD, if you live too far to visit. We can play at a variety of events, including outdoor parades, nightclubs, bars, Brazilian dances and private parties. 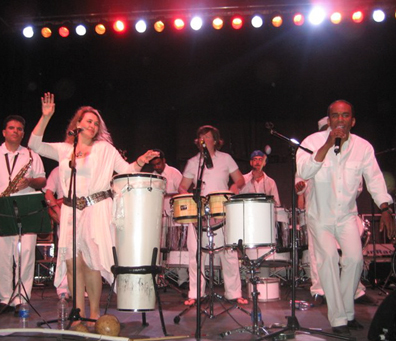 In addition to providing live samba music for dance parties, Deraldo Ferreira and Samba Tremeterra have given samba drumming workshops and demonstrations at various institutions and universities. Some of our events have included performing on a parade truck during a Columbus Day parade, playing for a Brazilian culture festival at UMass Amherst, giving a presentation and demonstration at the University of Maine, providing live music sets at Cyclorama and Soul Revival, and playing at the Brazilian Cultural center with such local artists as Paulao and Dub Station with Shaka Black. Depending on your preferences, a performance can last anywhere from 15 minutes to several hours. A typical performance includes six to ten drummers, a singer, and two to four dancers performing a variety of dances from different regions of Brazil. However, the exact configuration of the group and the type of performance can be adapted to meet your needs. We collaborate with many local artists and will provide a show to meet your specifications. If you would like to get a better idea of our performances, you can also take a look at the short video clips on the Sound And Video page.